Currently the main institution tasked with IWRM in South Africa is the Department of Water and Sanitation (DWS). Also involved in this area is the recently established Olifants Catchment Management Agency (OCMA) and in Mozambique, Ara-Sul (the agency responsible for the river basins in southern Mozambique including the Limpopo Basin) and DNA (Direccao Nacional das Aguas) responsible for policy, planning, monitoring, and reporting for water supply and sanitation. Both countries are part of LIMCOM (Limpopo Watercourse Commission). All these institutions are tasked – together with stakeholders – with developing and implementing strategies for water resources protection which are designed to ensure the long-term sustainability of the basin’s water resources so as to provide the goods and services needed by society into the future. Support for enhanced collaboration regarding IWRM between South Africa and Mozambique. Am example of co-operative goverance: securing enviromental flows in the lower Olifants. 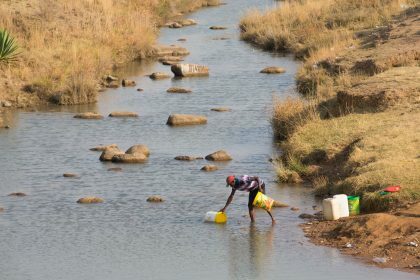 In response to the crippling drought and non-compliance with environmental water requirements in the lower Olifants since 2016, and in support of good adaptive governance, we have worked on securing a shift of water use from the Blyde to the De Hoop Dam to augment flows in the lower Olifants. If the Blyde dam drops below 25%, water cannot be abstracted, placing 10000 permanent and seasonal jobs at risk. A major success for RESILIM-O has been the partnership between AWARD, SANParks, Department of Water and Sanitation (DWS) and other partners which led to a release of water from the De Hoop Dam for the first time on 23 September 2016. AWARD has been given the responsibility of monitoring the flows and running our RESILIM-O De Hoop-Blyde release model when necessary to recommend further releases until we are out of the emergency state. Releases were made in 2017, 2018 and again in 2019, resulting in the Environmental Water Requirement (EWR) being met at Kruger National Park’s EWR site, Mamba Weir — a major success in a time of drought!